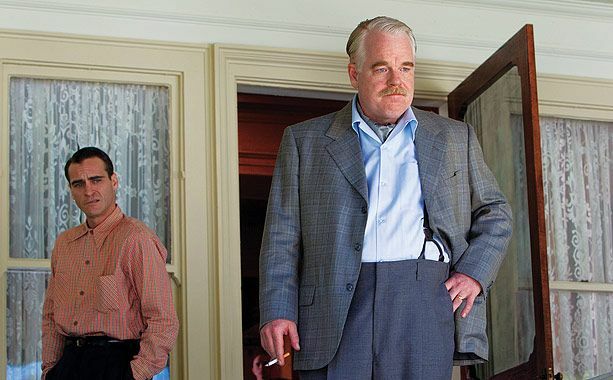 Tickets for Paul Thomas Anderson‘s The Master should be good for two screenings. The movie is so damn dense that there’s almost too much to digest on an initial viewing. Like his previous film, There Will Be Blood, The Master is hypnotic with its smooth, crisp cinematography and Jonny Greenwood‘s moaning, bluesy score. 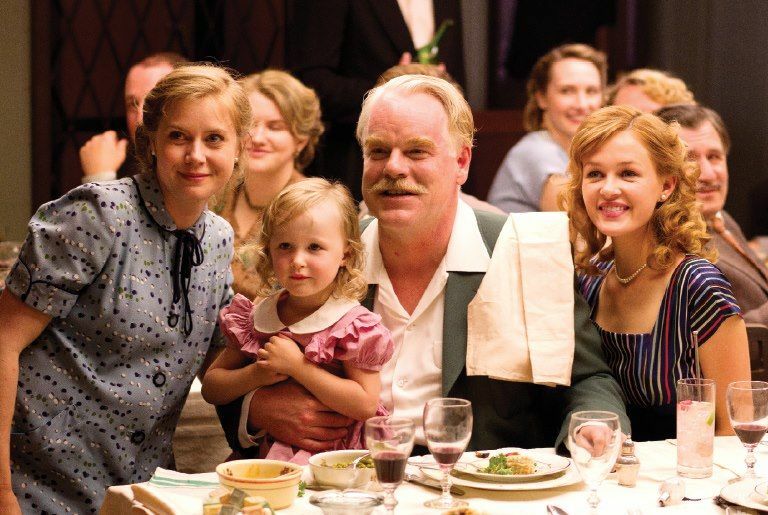 The story proceeds at a slow, methodical pace where the energy comes from the astonishing performances of lead actors Joaquin Phoenix, Philip Seymour Hoffman, and Amy Adams. But the craft and talent of the project was never in doubt. 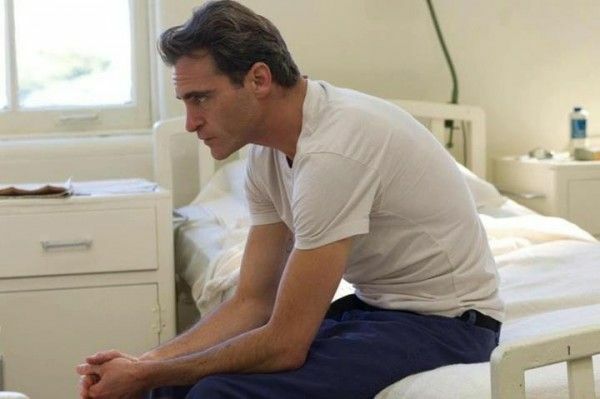 What makes The Master such a challenge is in trying to untangle the twisted themes and symbols presented by the central conflict between a mad dog and his owner. Freddie Quell (Phoenix) is a disturbed sailor who wasn’t quite right in the head even before he headed off to World War II. When he returns home, his violent temper and alcoholism stop him from keeping a job, and he ends up stowing away on a ship. On board he finds the charismatic and enigmatic Lancaster Dodd (Hoffman). Dodd is the founder of a new movement known as “The Cause”, which demands its adherents to look into their past lives, free themselves from doubt, and submit to rigorous deconstructions of their identity so they can be free from emotional pain. Freddie is seduced by Dodd, and the two form the nominal bond of mentor and protégé, but what they truly have is a captivating clash of Apollonian and Dionysian personalities. The Apollonian/Dionysian reading is the best I can do after one viewing. The two sides fit together and yet they’re at war. Dionysus was the Greek god of wine and winemaking, and alcohol is the initial reason why Dodd wants to recruit Freddie. Apollo is concerned with the life of the mind, and that’s where Dodd’s twisted Cause lives. Dodd provides some element of calm to Freddie’s tortured mind, and Freddie provides the occasional bacchanalia to Dodd’s pseudo-scientific, self-serious ramblings. “He’s just making it up as he goes along,” Dodd’s son Val (Jesse Plemons) tells Freddie, and that’s true. But that doesn’t mean the eponymous cult leader doesn’t believe what he’s preaching, and he certainly doesn’t mind the dominion he holds over his followers. And if Dodd ever has a moment of self-doubt, it’s instantly stuffed out by his wife, Peggy (Adams). The horrible co-dependent relationship between Freddie and Dodd is buried beneath the lush layers of Anderson’s brilliant direction. The pacing is lugubrious, patient, and deliberate to the point of sometimes being excruciating. It’s a slow burn that never ignites nor is it meant to. 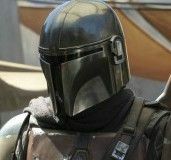 Characters can scream at each other, and Freddie will periodically lose control and get violent, but Anderson doesn’t wish to engulf us in flames of passion or fury. He wants to watch us drown (the opening image is an overhead shot of waves crashing against Freddie’s ship). Mihai Malaimare Jr.‘s cinematography, Greenwood’s score, Leslie Jones and Peter McNulty‘s editing all serve to slowly push us into the madness of the characters, and then the jaw-dropping performances finally drag us under. I’m not quite sure how to crack the film, but I could go on for pages and pages describing the greatness of the lead performances. Their broken, angry, desperate characters are played with conviction so complete that it’s utterly terrifying. Phoenix’s Freddie isn’t movie-insane. He’s not insane in the big, flashy “Look at all my tics to show how nutty I am”-way. Freddie has bursts of rage and can get a might twitchy, but the subtlety in the performance is what makes the character terrifying and absolutely captivating. Phoenix’s chemistry with his co-stars is sublime, and Hoffman plays Dodd so well that we can understand why people would be drawn to The Cause even though the philosophy is weak-sauce new-age nonsense fueled only by its leader’s charisma. We must be convinced that there’s only one person in the world who can control Freddie, and that person is Lancaster Dodd. And the only person who can control Dodd is Peggy. She has gone so far down the rabbit hole that she is no longer merely an adherent to the Cause. She is its unseen force, and Adams’ screen presence allows her to dominate every scene she needs to. Peggy is the only person who can break apart Freddie and Dodd, and she would do it not to protect her husband, but to protect his work. Ironically, she shares the same dependency as Freddie. The similarity between The Cause and Scientology is easily apparent, but not particularly interesting. Anderson isn’t doing a critique on the controversial religion just like There Will Be Blood isn’t a comment on the early 20th-century oil industry. The Cause is merely a gateway to see how people can try to complement each other and end up causing more harm than good. Freddie and Dodd need each other but their need may end up destroying them both. But that’s only one piece of a very large puzzle, and I couldn’t solve it in one viewing. I will finish with this note: After I left The Master, I felt the exact same way as I did when I left There Will Be Blood. I was confused and overwhelmed, and I didn’t know precisely what to make of the previous two-and-a-half hours. The craft was undeniable, and the performances were superb, but I couldn’t appreciate the whole picture. But upon repeat viewings, I love There Will Be Blood more and more. I hope I will feel the same way towards The Master, but after one viewing I know that at the very least I deeply respect Anderson’s new film and can’t wait to sink back into its cold, dark waters.